MAC has several beautiful collections coming out in the next few months, and most are nice but not I-Must-Have-This for myself. Then I saw the preview pictures from the Cult of Cherry collection. Goegeous fall colors! There are three quads and I love each. The cool colors have enough purple in them for me to adore it. Cool almost neutral colors then you have the blue one (A gorgeous color called Deep Truth), which gives it a great pop of color. Each quad has great every day colors, then one color that just electrifies the others and makes it a little more special and out there. The Shadowy Lady quad (cool colors) is my least favorite, but still very desirable. 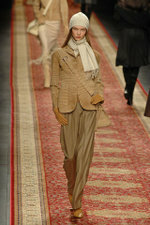 Will be great colors to wear with greys and blacks. The Spiced Chocolate quad is (for me) easily the most wearable with sumptuous warm colors. Cannot wait for this one! The Tempting quad is the curve ball. At first I saw the taupes and the brown grey THEN that crazy chartreuse and I said WHAT? But when you look at the swatches they are gorgeous together. You can use that great color that stands out in each quad as a crease color to take the colors from almost neutral to something that really grabs attention. I love these colors and will begin putting a little aside to get these. Release date is August 21st. Love these knit caps for fall (or year round here in San Francisco). Do not think I will be buying the ones pictured, as they are from Hermes. But a beautiful knit cap isn't hard to find. Love these looks! Brodie has short sleek fur. He looks like a little seal sometimes. He looks like he hardly ever sheds. This is, of course, a complete utter lie. This dog is half Pug, notorious shedders. 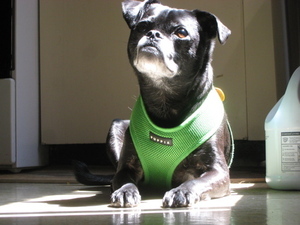 Even at half-Pug strength, this pup sheds a lot. And he isn't a big dog. But the fur coming off of him always suggests we have a pair of Newfoundlands, at least that's the way it seems to me. I can't, in good conscience, buy a Roomba (a little robotoc vacuum cleaner) because the poor thing would die, jammed and clogged with fur, on it's first mission. And it isn't like I don't clean. We have hard wood floors and sweeping is easy. But it is also easy for fur and hair from Justin and I to blow around. I clean but I also resigned myself to living in a fur-coated existence. Then I heard of THE FURMINATOR. A pircey dog grooming de-shedder, but worth it? I read a review of the Furminator and it's efficacy on a Pug and I was sold. Today when I went to The Pet Connection, I picked one up. It's $30. That is a lot for a brush, but it claims to be the last dog brush I will ever use. I brought it home and tried it on Brodie. OHMYGOSH, THIS IS THE LAST DOG BRUSH I WILL EVER USE. Yes people, it is that good (see pictures at end). If your dog has a lot of under coat and sheds, this may be the best thing ever. However, use it gently, we are not trying to shave the dog, gentle strokes in the direction the fur grows. And it isn't recommended for all dog breeds. To see if your dog is on the list check www.furminator.com and see. I only did it for 5 minutes and I did not follow the recommendation of doing this on a freshly washed and completely dry dog. And I got off a lot of fur! The claim of the Furminator is that if I use this for 10 minutes, once a week, I will eliminate 90% of the loose dog hair in my home! 'See for your self. I present, the Furminator and a picture I like to call Exhibit A.
I had mentioned previously my complete astonishment at how...there is no other word for it...COOL..Old Navy had gotten. I used to imagine them for family shorts and dowdy/comfortable sweatshirts. Talk about a fashion step up! I believe the mystery has been solved, because I did a little research (yes, this is the kind of thing I Google. What?) and discovered that as of last October the very talented designer Todd Oldham had been hired to oversee Old Navy's creative direction and put his fingers in the Old Navy design and image pots. What we are seeing now is that influence. This is much like how GAP (Old Navy's parent company) hired Patrick Robinson to do the same for GAP. While I was a little slow to discover this awesomeness, I have embraced it whole heartedly. Especially the Spotlight Collection. I don't love EVERYTHING in the collection, but the pieces I do love (which I bought) I love completely and wear ALL THE TIME now. And isn't that the fun of clothes? And shouldn't clothes BE fun? Something you love and enjoy. 1 pair of "skinny jeans" -I swear I never ever thought I could wear these leg hugging jeans, but I tried them on and I did NOT look like a dachshund wearing legwarmers. Amazing! They were in proportion and looked cute! LOVE the skinny jeans! 1 grey top that is sort of like a sweatshirt, except a hundred times cuter and more figure flattering. Ok, so I went a little nuts and took the current presiden't request to heart about stimulating the economy. But this is also Old Navy, where I didn't break the bank. Got to love that. Plus, I quote the very savvy and fashionable Nicole M. Crum, Esq. who once said to me "When it comes to clothes, I don't question love". 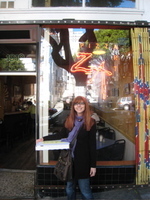 There are TONS of pizza places in San Francisco. Justin and I have tried very few. We haven't given North Beach/Little Italy a tenth of the attention it deserves. But we have tried some pizza places closer to home. Cybelle's on Bush is good and fast. I walk past them almost every day and the open windows always make it tempting to grab a few slices to take home to dinner. Victor's on Polk is also yummy. You can't go wrong with those two. But the best we have found is Pizza Art, in Russian Hill on Hyde. We have walked past many nights and the small shop is always packed with people waiting outside to get pizza or a table. It always smells wonderful too, as many pizza places to. So if you have the time to wait (or you go early) give Pizza Art a try, on Hyde in Russian Hill. You can eat outside and watch the cable cars go by every 10 minutes. Was knocked out yesterday with a nasty headache, so stayed home. Brodie was a good companion while I read/slept. Nothing else to report today. Head still touchy, but not the pounding annoyance of yesterday. As you can see, Brodie continues to turn grey on his muzzle, paws, ears and oddly, the backs of his legs. I think it's adorable and frequently tell him how handsome he is and that the look is "very George Clooney". It was so great! 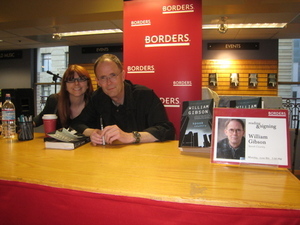 I went to Borders after work and waited to hear William Gibson read a chapter from his new paperback Spook Country and sign autographs. He was a really nice person to meet and the Q & A was engaging, funny, and thought provoking. He touched on technology in the modern world but was also funny and quirky. I can't wait to read my new book. I love Gibson's distinct use of language, especially in the first chapter of Pattern Recognition. And look! I got a picture! How did this get by me?